Don’t turn off your company culture at 5 o’clock. Host a calendar of company events, wellness activities, and social meetups all in one place. One unified wellness calendar for everything from lunch-and-learns and lectures, to yoga classes, league sports, and the annual company 5k. IncentFit Events helps your employees find ways to spend time together outside of meetings. Forget about unread event invites and posters by the watercooler. Improve your event attendance with a convenient mobile calendar that’s always in sync. Go! Employees browse, connect, and find events they love. 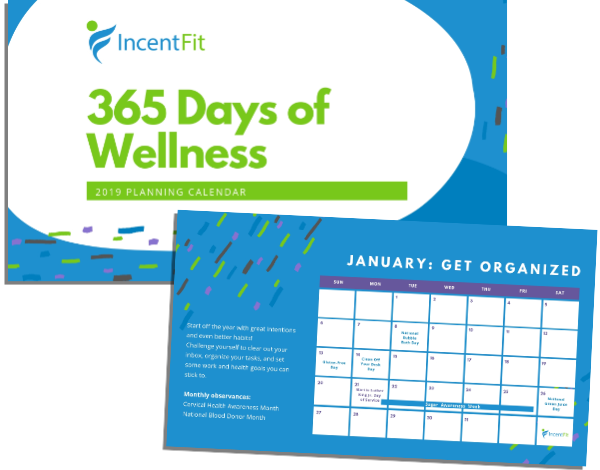 Keep all your wellness events in one place and save time while you plan for 2019! We’ve got you covered with a calendar of monthly themes and 100+ important dates. IncentFit Events is new for 2019! Learn how your company can be the first to try out this new product.